Back when I wrote of my adventures in wild Abkhazia, I talked about shashlyk, spices, cheese, honey, and wine. And of course lodochka (aka Adjaran khachapuri). But there can be more to Abkhazian cuisine. Some time ago, I published a recipe for Honey Cake Gagra with Mandarin and Black Tea. Here is another original recipe that combines many local flavors into a more elaborate dish. 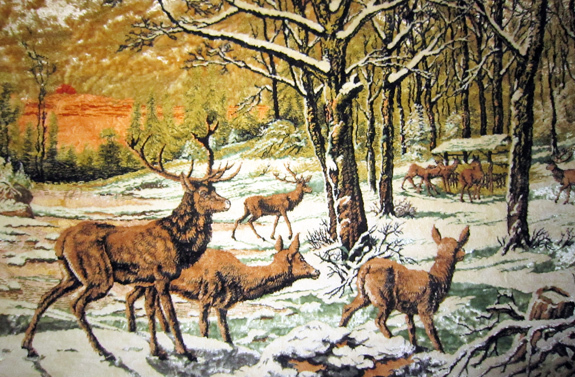 Yes, there are deer in Abkhazia. I even remember that the driver who picked us up at the Ingur border was a hunter. I suppose that people have got to find a use for all their guns, now that they’ve (sort of) got their independence! The idea for a blackberry sauce comes from a sadly unidentified Abkhazian cookbook, though the recipe below is mostly adapted from Michel Roux’s Sauces. I believe the Abkhazian version contained garlic and adjika; I’m keeping it for another time. The cheese polenta is called abista in Abkhazian. In Georgian it would be called elardji (it’s particularly popular in Mingrelia). The cornmeal is traditionally white, but yellow polenta works just as well. If you don’t have the courage to make your own cheese, and don’t have a Russian supermarket in your area, you can substitute mozzarella for the sulguni. After the debacle of 2012’s deer hunting season, when I spent 3 days on a tree stand and 3 nights in a tent in the middle of the Adirondacks without seeing a single deer or bear, and eventually rushed back home to NYC on deserted roads moments before Superstorm Sandy hit the shores… I needed a better plan for 2013. Vepřo-knedlo-zelo — literally “pork-dumpling-cabbage” — is Czech Republic’s national dish, but you’ve probably never heard of it. Maybe because the dish name contains one of the most difficult to pronounce letters known to mankind (the ř, affectionately called a raised alveolar non-sonorant trill in linguistics circles, is apparently shared only with the Kobon language of Papua New Guinea). Or it could just be that most of the time, there’s really nothing about this dish to wax lyrical about. In many restaurants, you’re likely to receive dry slices of roasted pork, a heap of plain, soupy cabbage, and enough bread dumplings to smother you to death, even when there’s no sauce to mop up with them. On my way to Moldova this past summer, I decided to brave the Russian bureaucracy (the eternal visa schemes) and traffic jams (2 hours from Sheremetyevo Airport) to spend one evening in Moscow. To make it count, I looked for restaurants serving cuisine that I was unlikely to eat anywhere else in the foreseeable future — this excluded the many Georgian and Uzbek joints. I found a small handful of Kazakh and Tatar restaurants, but the place that captured my attention served Buryat cuisine. Located in the former space of an iconic Soviet jazz club, restaurant Selenge calls itself a Buryat-Mongolian restaurant. The Republic of Buryatia is an area of Russia that borders Mongolia, and indeed their two cuisines are very similar — one difference being that Buryats prepare several dishes with Baikal omul. The food at Selenge was a bit uneven, but one of the better dishes we tried was the buuzy, a local variation on Mongolia’s national dumpling. There seem to be several regional recipes, with differences in the meats (lamb, beef, pork, chicken, fat) and vegetables (onion, carrot, cabbage) being used. The Buryat version typically consists of a mixture of beef, pork, onion, and garlic, and at Selenge the dish was served with grated carrot on the side. There are also a few variations on the traditional round purse shape. In addition to the above video, you might want check out this recipe for a slightly different folding method. I decided to make Mongolian buuzy for the latest round of Ingredient Matcher‘s national dishes competition. 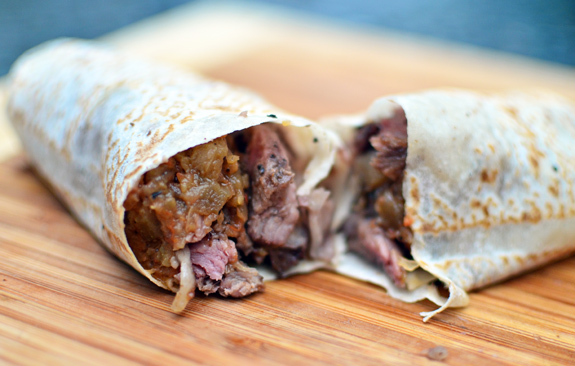 The Buryat rendition I’m publishing here prepares the meat filling slightly differently. First, I add carrots to make it a bit more interesting, as the traditional seasoning apparently consists of little more than salt and pepper. Then, I cook the mixture beforehand to make the meat more tender. Since the meat is coarsely chopped by hand, it can be a bit tough if it’s not cooked enough (this is a complaint I often make about manty in Uzbek restaurants). Finally, I prefer rolling the dough very thinly, and then making my dumplings on the smaller side to be able to handle them more easily. With a sharp knife, cut both meats into 1/4″ small dice (if you want to save some time, you could grind the meat once through the large die of a meat grinder). Chop the carrots and onions into small dice as well, and mince the garlic. Sauté all the vegetables with half of the olive oil in a pan over medium heat, and cook until golden brown. Reserve. In a pan over high heat, brown the meat in the rest of the olive oil. Reduce the heat to low, add the vegetables, season with the salt and black pepper, and stir for a minute. Add the stock, cover with a lid, and simmer over low heat for 30 minutes. Let cool, then transfer to a plastic container, and refrigerate for at least 1 hour. In the bowl of an electric mixer fit with the paddle attachment, place half of the flour, plus the salt, egg, and water. Mix over low speed until homogeneous, scraping down the sides with a spatula. Add the rest of the flour and mix again until it forms a smooth paste. Keep mixing for one more minute, then wrap in plastic, and let rest at room temperature for 30 minutes. Divide the dough into 4 equal parts to proceed in batches. On a floured surface, roll the dough very thinly. You can use a rolling pin, or a pasta machine (all the way to the thinnest setting). Make 3.5″-diameter discs using a cookie cutter. Place a small spoonful of meat filling at the center of each disc. Holding it in the palm of your hand, shape the disc like a purse, and pinch the edges all around the top. The goal is to create folds on all sides to make the dumpling look pretty, and keep the top of the dumpling closed (it is okay to have a tiny bit of filling showing). Repeat with the rest of the dough and filling. The dough scraps can be re-rolled to make more dumplings. Place the dumplings on a steamer insert lined with parchment paper, and steam in a closed pot for 15 to 20 minutes, depending on the thickness of the dough. If you don’t have a “dedicated” steamer, there are plenty of ways to make your own — Google is your friend. Sprinkle the dumplings with scallions, and serve immediately. Although I’ve already posted plov recipes here and here, I wanted to go back to a more canonical version that I could submit on Ingredient Matcher. A plov that’s very traditional in its ingredients, and at the same time easy enough to prepare. 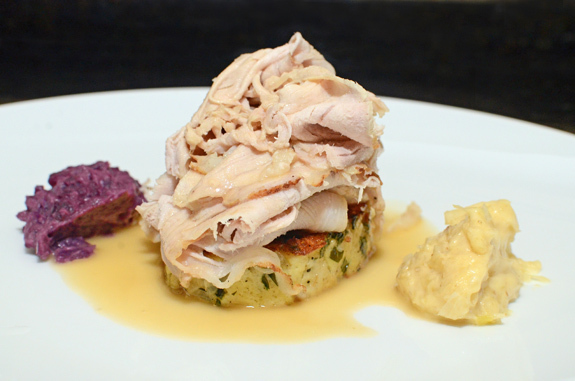 No sous-vide lamb, no need to kill your own turkey, and no useless rituals à la Stalik. A cousin of pilaf and pulao, plov (also called osh) is the national dish of Uzbekistan, and to a certain degree, Tajikistan. Almost every region has its own version, even if the differences can be quite subtle sometimes. Tashkent plov, for example, is made with yellow carrots, and can be served with kazy, horse sausage. The bases are more or less invariable, though. Expect all or a subset of the following: carrots, onions, garlic, currants, chickpeas, lamb, and a fair amount of animal fat. And of course, the essential Uzbek spices, cumin and coriander. As for the rice, Uzbek markets sing the praises of “Alanga”, “Avangard”, or “Super Lazer”, typically ranging from medium to long grain. Since I’ve never seen any of these varietals outside of Central Asia, I would recommend using… whatever you want. Risotto rice will definitely give you better absorption, therefore a more flavorful result. Long grain American rice (not the par-boiled crap, please) will work, too, and is probably what you get at Taam Tov and Rego Park restaurants. Mix the salt, cumin, coriander, and chili pepper in a container. Season the lamb with the spice mixture on all sides. In an oven-proof pan over high heat, sauté the meat in the oil until brown on all sides. Add the garlic, cover with a lid, and cook in a 300 F oven for 2 hours. Remove the lid, and cook for another 15 minutes. Take out of the oven, and let rest 10 minutes. Reserve the meat and garlic. Transfer the cooking liquid to a plastic container to separate the fat from the jus. Rinse the rice under running water, then place into a bowl and mix with the currants. Reserve. Heat 3/4 oz of lamb fat in the wok. Add the onions, season with salt, and cook over high heat until brown. Stir in the ground star anise, cumin, coriander, and chili pepper. Add another 3/4 oz of lamb fat and the carrots, and cook until soft and golden brown, stirring regularly. Add the rice and currants, the chickpeas, the lamb jus and remaining fat. Cook over medium heat without stirring, until the liquid is fully absorbed. Add the vegetable stock, mix with a spatula, turn the heat down to medium-low and simmer until the liquid is almost completely gone, stirring regularly. (Supposedly you don’t stir traditional plov, but in my experience not stirring is likely to produce unevenly cooked and seasoned rice.) Taste, rectify the salt, and add stock if necessary. The exact amount of stock that you’ll need depends on the rice variety. The rice should be completely cooked, and the liquid fully absorbed. Arrange the meat and garlic on top of the dish, turn off the heat, cover with a lid, and let stand for about 15 minutes before serving. Tajikistan claims mainly two national dishes: plov (aka osh), and qurutob. While plov is more famous and is also the national dish of neighboring Uzbekistan, qurutob, a mix of bread and onions in a yogurt sauce (with the occasional extra meat and vegetables), is specifically Tajik. Tajik culinary literature is pretty scarce. Pan-Soviet cookbooks typically included a short section about Tajikistan, a handful of booklets must have been published with very small circulations in Dushanbe in the early 1990’s, and a few bloggers have posted recipes here and there. But overall, with Tajikistan being one of the poorest countries in the world — and with its independence immediately followed by many years of civil war — circumstances haven’t encouraged such recreational endeavors as cookbooks. Qurutob recipes seem even rarer. The dish obviously exists — I ate it in Dushanbe. The only version I could find comes from someone who obviously fantasized about Tajik food for a short while before trying it in its natural environment, and subsequently quitting blogging altogether (Tajik reality can be tough like that). Her post was later adapted by another blog that aims to cook a dish from every existing country. The latter post has a lot more background information about Qurutob than the former, but I think the explanation in any case is that this is meant to be a trivial, quotidian dish. Like an omelette. That is, you buy your fatir bread and qurut cheese at the market, sauté some onions, put everything together, maybe with some fresh tomatoes and scallions, or maybe with some other vegetables, and you’re done. It just happens to be harder to make for us Westerners because, well, the Walmarts, Tescos, and Carrefours of the world haven’t started selling fatir and qurut for some strange reason. But fear not! It’s not all that hard to make the whole entire thing from scratch. It’s just a little bit more involved — and the result may taste even better than in Tajikistan. Fatir (which is actually different from Uzbek patir) is a flatbread made of a very rustic puff-pastry-like dough. Don’t be surprised if it turns out stodgy and a bit dry: that’s what it’s supposed to be like! It will taste much better when it soaks up the yogurt sauce. The latter is prepared with the qurut. Accept no substitute; these are small balls of dried salted yogurt. By baking yogurt in the oven, you can make a quick version that’s pretty close to the real deal, even if your balls aren’t quite smooth and pretty enough to make a living selling them at the Dushanbe market. (I hope you choose higher goals in your life, anyway :-)) Finally, the roasted lamb is optional: I’ve seen restaurants serving both vegetarian and meat versions. Place the flour and salt in the bowl of an electric mixer fit with the paddle attachment. While mixing on medium speed, add the water, then the egg, and keep beating for 1 minute. Shape the dough into a ball, cover with plastic wrap, and let rest 30 minutes. Place a baking dish full of water in an oven set to 450 F.
On a floured surface, roll the dough to a 6″x12″ rectangle. Cut it lengthwise into two long strips. Mix the butter and lamb fat in a bowl, and spread on the dough. Roll the first strip into a cylinder, then place it on the second strip and roll the whole into a thicker cylinder. Cover with plastic wrap, and refrigerate for at least 1 hour. Place the unwrapped cylinder of dough vertically on a floured surface. Using the palm of your hand, flatten the dough progressively to a 1/2″-thick, 7″-diameter disc. While doing this, sprinkle the top generously with flour, and flip the dough frequently — otherwise your dough will be stuck to the counter in a puddle of grease! Prick the flatbread with a fork to create a decorative pattern, then sprinkle the sesame seeds on top, and gently press with the palm of your hand to encrust the seeds in the dough. Transfer to a baking sheet lined with parchment paper, and bake in the oven for 25-30 minutes, until the top is golden brown. Transfer to a cooling rack, and reserve. Pour the yogurt into a baking dish, and cook in a 300 F oven for 1 1/2 hours, without disturbing it. Pass the yogurt through a chinois, gently pressing with a spatula to extract more whey. Discard the liquid. Mix the solids with the salt, return to the baking dish, and cook for another 30 minutes. Remove the yogurt solids from the dish. If you’re a purist, divide the solids into 4 parts, and squeeze each one in your fist to make balls — this is the shape of the qurut sold in Central Asian markets. However, since we’re going to break down the balls to make the sauce in a minute, you can just reserve the solids in a container instead, without shaping them. Mix the salt, cumin, coriander, and chili pepper in a container. Season the lamb shank with the spice mixture on all sides. Add the tomatoes, cover with a lid, and cook in a 300 F oven for 2 ½ hours. Remove the lid, and cook for another 30 minutes, flipping the shank halfway through. Take out of the oven, and let rest 10 minutes. Pick the meat from the bones, trying to keep it in large chunks. Remove the skin from the tomatoes. Transfer the cooking liquid to a plastic container. Reserve. In a pan over medium heat, sauté the onions with the olive oil. Season with salt, and cook until golden brown, stirring regularly. Crumble the qurut balls into the pan, add the lamb cooking liquid and the water, then simmer for a couple minutes, stirring constantly. The amount of water you need to add may depend on the texture of your sauce. You want a sauce that’s pretty thick and lumpy, but still liquid. Tear the fatir into small pieces (1″ to 1.5″ squares), and toss into the pan. Transfer to a ceramic dish, and arrange the meat and tomatoes on top. If necessary, reheat in a 300 F oven for 5 minutes. Top with the parsley and basil. Serve the dish in the middle of the table and eat with your fingers. 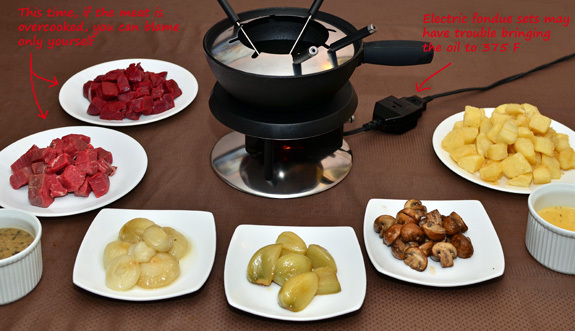 Shashlyk po-karski (Kars-style shashlyk) is a rather mysterious dish. Every time I’ve ordered it in restaurants, I’ve been served either a rack of lamb or individual grilled lamb chops. What made either version specifically from Kars, a Turkish town that once belonged to medieval Armenia? Why not call it chalakhach, another dish of mysterious origins that seems to consist of grilled lamb chops? 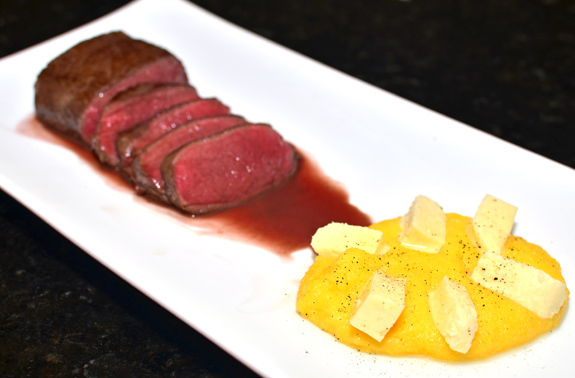 The dish requires round chunks of lamb loin of similar shapes, each weighing about a pound. 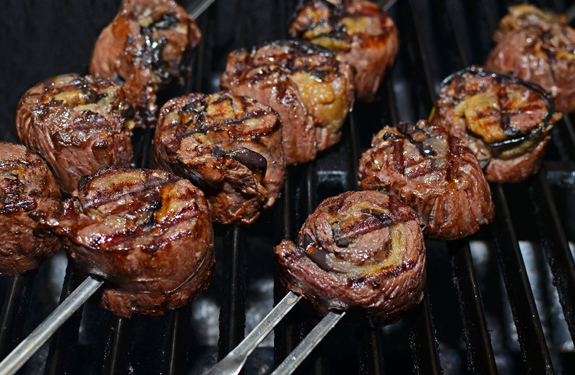 The marinade is different from what you use in Georgian mtsvadi (Georgian kebabs tend to be minimally marinated). The shashlyk is cooked progressively, and thin pieces are cut off the outside while the rest keeps grilling. This still doesn’t explain why Kars Armenians decided all of a sudden to invent this Turkish-sounding dish, but I think I have a theory. Labor Day’s already over, a week behind us, and you probably think you’re done with barbecues until next year. You’ve spent the past two (three?) months reluctantly pigging out with wrinkled beef franks and shoe-sole patties prepared by self-proclaimed Grill Masters who swear by their kerosene-soaked charcoal briquettes. You’ve hung out in 100+ temperatures next to a burning hot charcoal fire when you could have been inside sitting in front of the AC. You’ve guzzled all the mediocre beverages that marketing campaigns have disguised as summer drinks just because they need to be served ice-cold (I’m looking at you, Provence rosé). There is a better barbecue life out there, and it’s not too late! And no, I’m not talking about tailgating season. When I published my recipes for lángos and goulash sauce, I promised that these were the building blocks for more complex dishes. The wait is now over, as today I present my own version of Korzo Haus‘ famous Korzo Burger. I wanted to make this burger as Hungarian as could be. Lángos was not enough, so I added goulash sauce with sautéed onions and red peppers. Sauerkraut would be another option — making my own is a project I need to tackle soon. To top the patty, Hungarian cheese may be hard to find, but a semi-firm cow’s milk cheese is a faithful approximation. 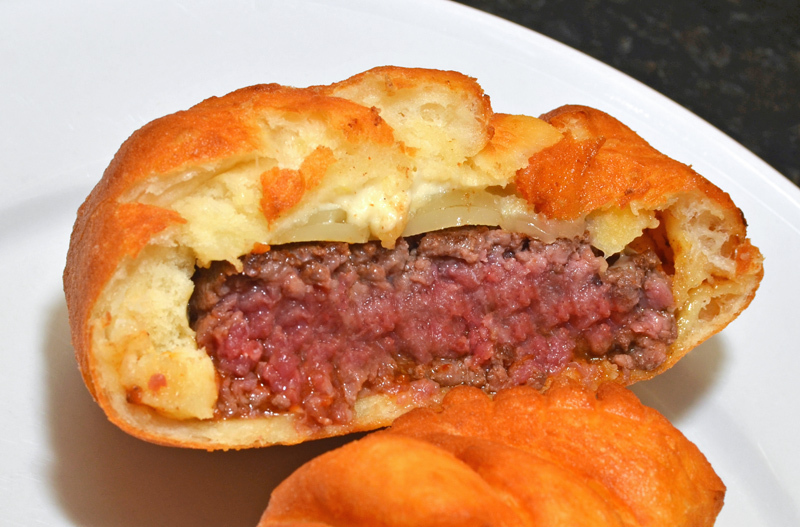 This meat patty recipe is inspired by Heston’s Bluementhal’s Further Adventures in Search of Perfection and Nathan Myhrvold’s Modernist Cuisine at Home, although the final meat mixture composition is mine. I’ve been experimenting with various beef cuts for years. Hanger steak brings bold beef flavor, short ribs add fat (and therefore both moisture and flavor), and the “edge of eye” (a term apparently invented by FreshDirect for the meat situated between the chuck and the ribs) provides a classic patty base. It makes sense to grind the less tender hanger and ribs twice, while the chuck/rib hybrid needs only one pass through the large die. As for the cooking, I find that Myhrvold’s sous-vide method truly results in the best texture: an airier version of commercial patties sans pink slime, with the perfect doneness. Korzo Haus uses nothing more than a good old grill, but I think the sous-vide improvement is worth it, especially since the meat blend is less cohesive than your typical 100% chuck. In a pan over medium heat, sauté the red pepper and onion in the olive oil. Season with salt, and cook until golden brown. Remove from the heat, and reserve. Weigh all the meats to determine their total combined weight, then measure 1% of that weight in salt. Grind the short rib meat and hanger steak meat using the fine die of a meat grinder. Wrap the ground meat in the plastic wrap, shape into a 3-3.5″ diameter log, and add another tight layer of wrap. Refrigerate for at least 2 hours. Slice the ground meat log into six 6 oz patties, and remove the plastic wrap. Place each patty in a sous-vide pouch with 1 tsp of oil, vacuum-seal, and cook in a 131 F water bath for 1 hour (you can also put 2 patties and 2 tsp of oil in one pouch). If you want a more well-done burger, increase the temperature of the water bath by 5 or 10 degrees. Proceed with assembly steps immediately. In a pan over high heat, sauté the beef patties in canola oil just long enough to brown them on both sides. Remove from the pan, top with cheese slices (about 0.75 oz per patty), and let cool for 5 minutes. 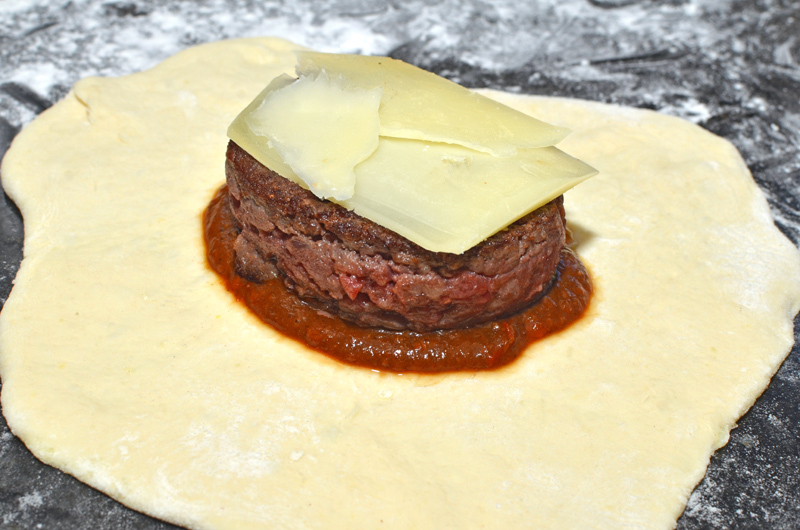 At this point, the meat should be cooked exactly as you like it, as it won’t really cook more when you deep-fry it inside the dough. Heat canola oil in a deep-fryer to 375 F. If you don’t have a deep-fryer, a pot and a thermometer work just as well. Divide the the lángos dough into 6 pieces. Using a rolling pin, roll each piece into an 8″ diameter disc, keeping the centers slightly thicker if possible. Spread a little bit of goulash sauce in the center — I recommend using between 1 and 1.3 oz, as a larger amount is likely to cause leaks. Place a patty on top, then some (about 1 oz) sautéed vegetables. You can tune these proportions to your liking. Close the dough like a purse, and using scissors, cut off the excess dough from the top. 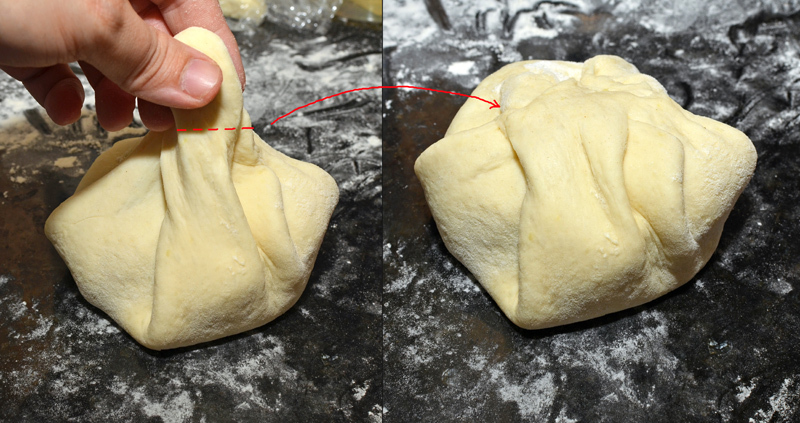 Proceed quickly; don’t try to reshape the dough too much, or cut the top multiple times, because each manipulation tends to stretch the dough at the bottom. At most, if you see the dough is too thin in one spot, pinch it to avoid holes. Drop the burgers in the deep-fryer quickly (to avoid stretching the dough) but carefully (to avoid spending the night in the ER). Proceed in batches — you may not have space to cook more than one burger at a time. Fry until golden-brown on all sides. How long does this take? I don’t know! You should keep busy basting and flipping the burger, watching for that perfect golden-brown color, instead of checking the clock! Remove from the deep-fryer, and drain on paper towels. Let rest for a minute. 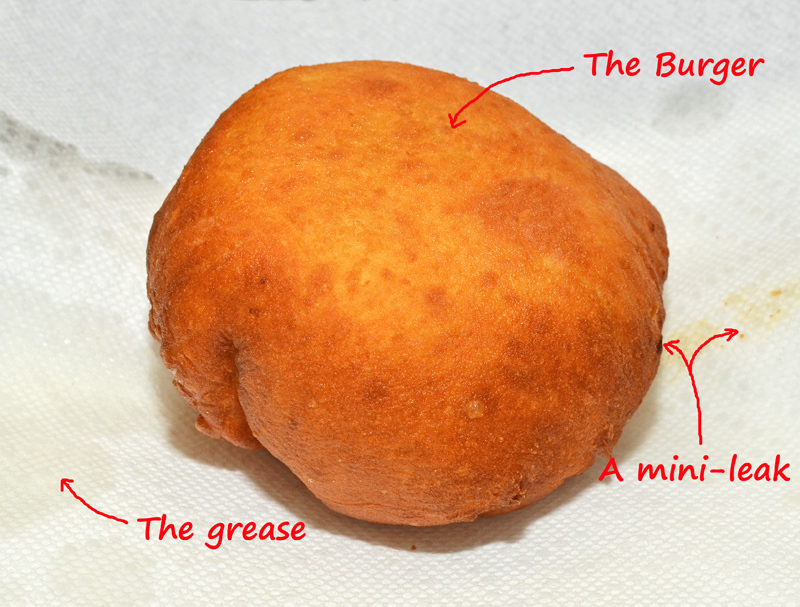 If a small hole forms in the dough, some sauce will escape, and the oil will bubble a lot and get dirty. The part of your burger with the hole will be more cooked, but it should still be edible. Cut each burger in half, and serve. For as long as I’ve been reviewing restaurants, I’ve been complaining about the mediocrity of their Beef Stroganoff: “the filet mignon was chewy, cooked beyond well done”, “another example of how to transform an expensive and tender cut of beef (the tenderloin) into shoe sole”, “the overabundant mushroom sauce had the gooey texture of something made with a store-bought mix”, “the leftovers sit unclaimed in our fridge”. While some restaurants have fared a bit better (here and here), I felt like I should give my own version to justify my criticisms and prove that yes, you can make a good Beef Stroganoff, and it’s not even that hard.